Ever since Claire asked in episode 201 “who won the Battle of Culloden?” we’ve been gearing up for a bloody confrontation, and this week we got one. But not Culloden, not yet. This was Prestonpans, and the Scots won...at least in the history books. This episode reminded us that there’s a lot more to any battle than winning or losing. On the surface, “Prestonpans" was the story of how Prince Charles’ cobbled-together Jacobite army defeated the British with a stealth attack. A famous battle that every Scottish child learns about in school. Historically it happened pretty much as the show depicted: a very quick, early morning raid in the mist, made possible by a local farmer’s son who knew a route through the marshland. Outlander did a brilliant job getting across just how horrifically bloody and unpredictable these face-to-face battles were. But it was the fictional narrative - the intertwined relationships between characters - that was the real story of this episode. At the forefront was our King of Men: Jamie Fraser. Of course it was technically Prince Charles’s army and he was determined to lead the men into battle - while dressed as a “shortbread tin” (the actor’s words, not mine!) Knowing this would be disastrous, Jamie set him straight right away, firmly ordering the Prince to stay put. Jamie was also the only real voice of reason among those attempting to plan the raid - offering logical arguments while the actual Army generals squabbled over personal affronts, and convincing Charles that it was time to make decisions. The Prince is really just an annoying kid trying to please a father who has little use for him (he’s the Blackadder of Outlander!) But I do feel a bit sorry for him. There are glimpses of a man who could have been a leader in the right circumstances, and he is trying to do the right thing by constantly reminding everyone that the British are as much his father’s subjects as the Scots - which is great, but he tends to forget that right now they are the enemy. I rather enjoyed imagining the less-than-diplomatic responses probably going through Jamie’s head when Charles admits “I don’t think my father is all that fond of me”. And you certainly don’t have to imagine what Jamie’s thinking when the Prince tells him to order Claire to treat the wounded British first - it’s written all over his face! Then there’s Dougal - a perfect character, but as a human being he’s totally losing the plot. Jamie’s walking a fine line keeping the peace everywhere he turns, but no more so than with his uncle.The bloodthirsty MacKenzie ‘War Chief’ looked like someone out of The Walking Dead, going around finishing people off with his dirk. For a brief moment I wondered (hoped!) that it was mercy, but no. Dougal is an intelligent man - but he’s not smart at all. (Even his horse was smarter than he was, refusing to go any further across the marsh). Jamie gave him every opportunity to be a hero for his revered Prince - and for a brief while he was. But Dougal being Dougal, he instead shot himself in the foot quite spectacularly leaving Jamie to fix things again. Thinking on his feet, Jamie narrowly manages to to give his uncle a respite from complete exile. There’s no longer any doubt that Jamie is the leader and Dougal the follower. And Dougal knows it. In direct contrast to Dougal’s desire for savage glory, a contemplative Murtagh worries about being forgotten, dying without meaning. Later, he wants - and gets - assurance from Claire that they are supposed to win this day…but it’s left unspoken that knowing they win doesn’t mean she knows who will or won't survive. And of course, there are many deaths on both sides, and it would have been rather unbelievable had the Scottish losses not included any of the Fraser-led men. We’ve had character deaths before, but this was the first time we lost someone who had been a part of Outlander from the start. Angus was one of the Highlanders that Claire encountered in the first episode. Not exactly the most savoury of characters (he often made me cringe even more than he did Claire), but by the time he helped rescue Jamie last year he’d proven his loyalty. Apparently there was just a big softie underneath all that hair. Rupert will be lost without his sidekick. But the core of the show is always Jamie and Claire; and while Claire rallies the women, Jamie has the weight of the world on his shoulders. Yet that seems to bolster him. Ever the diplomat, Jamie even tries to bridge the gap between the British and Jacobite soldiers in the field hospital (albeit with a rather crude game. Men!) But when he needs support, it’s only Claire who can give it. They don’t even need words - the kiss before he left was one of the most emotional and sensuous between them that I’ve seen - and there have have been a lot! It was a perfect scene: Claire’s “On your way soldier”, and like a Knight he bows to his lady as he takes his leave. Likewise, Jamie’s return is just as strong: He comes back all over the place, triumphant but dazed. It’s not until he sees and reconnects with Claire that he snaps out of it. 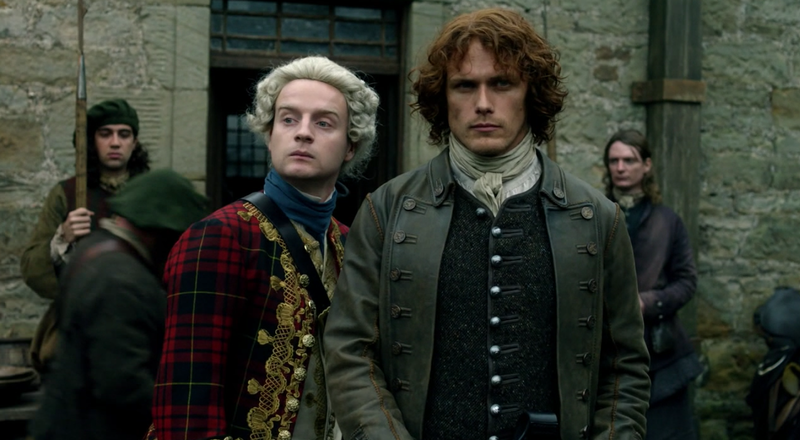 Although the real Battle of Prestonpans had no Jamie or Dougal, no Claire, no Angus...you can be sure that it had it’s own real life heroes, who acquitted themselves just as nobly (or despicably) as those on our screens. But I sincerely hope that they didn’t have to suffer through someone saying “Mark me…” all the time!